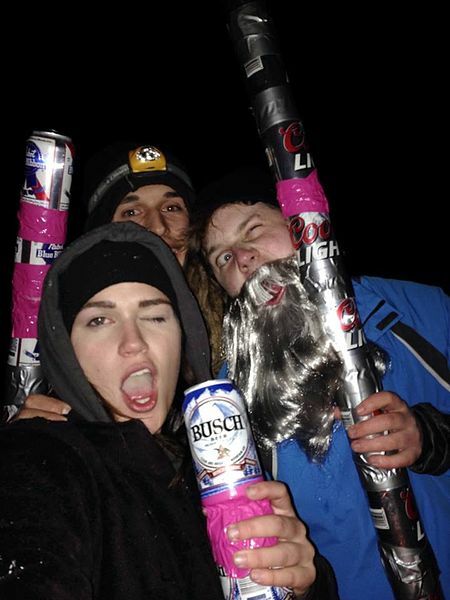 Also known as Wizard Sticks or Wisest Wizard, Wizard Staff is a simple drinking game in which players attempt to consume more beer than their opponents. The game requires just a few simple supplies and friends. Wizard Staff is a great game to play with a large group or an entire party of people. Playing Wizard Staff requires little skill but a lot of endurance. The basic premise of the game is to drink as much as possible. Starting with a can of beer, drink the entire thing. Once you have completed a second can, place it on top of the first can and secure with duct tape. Repeat the process with new cans until your cans resemble a wizard’s staff. Each can on your wizard’s staff represents a level. Therefore, if a player has six cans on his wizard staff, he is a level 6 wizard. Every time a player completes three levels, he must perform in a boss battle. A boss battle means that the player must take a shot. The player cannot continue drinking beer until he has finished the boss level. To make each boss level more difficult, have several types of hard liquor on hand. There are a number of variations to the game. In the White Wizard variation, a player who reaches level 10 becomes a white wizard. Once another player reaches level 10, the two opponents must battle each other with their staffs. The wizard who breaks his opponent’s staff first is the official white wizard and the winner of Wizard Staff.